Picking up where I left off.... we headed over to Survivor after that, since Vanessa and Emmanuel were in line for it. We waited 15-20 minutes, and then the ride got stuck. It was stuck for a good 15 minutes, with passengers on it. Vanessa and Emmanuel were actually ready to be next (the ride holds 40 people at a time), but they ended up shutting it down completely after they got the passengers off. So we wandered back down to the other side of the park. Jonathan got a pretzel, and I had some water. 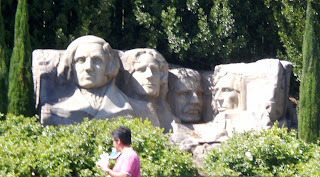 We sat right in front of their version of Mount Rushmore, which seemed rather out-of-place (the only other random Americana mark was the nation's flag in landscaping). 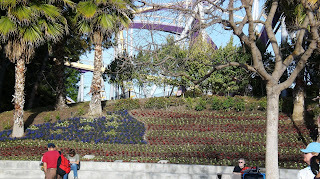 We walked over toward The Demon, and checked out a few other rides on the way. It's at this point that I really should explain why we weren't trying to get on more rides... Great America is more of a glorified County Fair than a genuine theme park. 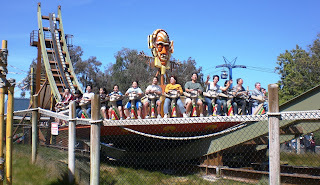 Apparently, years ago when it was owned by Paramount, the theming of the rides was much better, and there was movie paraphernalia throughout the park. Now, notsomuch. The fact that swings, carousels, and rides like "the orbiter" dominated a large chunk of the park made it very cheesy. We had a shortlist, and ended up doing them all except one, which I'll get to later. Back to The Demon. We waited in line twenty minutes or so before we got near the front. Again, VERY POOR organization. While waiting in line and watching the coasters go by, we noticed whole empty rows. This would NEVER happen in the Orlando parks. With nobody directing you, people just didn't know what to do on their own, I guess. We were probably 4 trains from riding when two girls got scared and chickened out, offering us their slots. So, we waltz up to the second row, to be on the next train. The train that was pulling out at that moment was empty in the FRONT ROW for crying out loud! We board, and we're off. It was the jerkiest steel coaster either of us had ever been on. It seemed to be rear-pushed more than front-pulled, which could have been part of the problem. It was a pretty decent coaster, and tried harder than most to fit a theme throughout the ride. There were several caves, and I kid you not when I say the rope lighting inside strongly resembled the quality of those found at Walgreens. It was actually a pretty good ride all things considered, although the turns are sometimes so hairpinny that your head gets stuck to one side for the remainder of the ride (which hurt my ear since it pinned my earring into my neck, and gave Jonathan a slight headache). 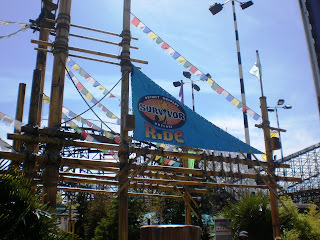 We went and got in line for Survivor again, since it had been a while and we heard it was open again. Now, for those Floridians wondering, these maintenance problems are nothing like the ones in FL. 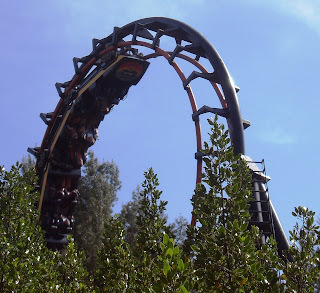 When Sheikra gets closed at Busch, it's enough to make you avoid that ride for the rest of the day, since there really is a danger of getting hurt or freaked out (non-FL peeps: that ride is infamous for getting stuck at a 90-degree floorless drop). Survivor is really harmless, but a great design. It's something that County Fairs could pull off, since it's not overly complex, and offers something different. It's a simple two-way plane-track with a couple humps. 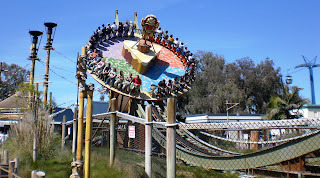 The cart is a giant circle, where you sit facing outward, and the platform spins as you go back and forth along the track. But that's not all. While a group of 40 is on the ride, another group of 40 is standing on colored dots (think ORGANIZED WAITING AREA) that correspond to the four quadrants on the cart. There's a video going of two Survivor winners getting the waiters to stomp, clap, and chant. Supposedly there's sensors which pick up on which dots are making the most noise, and those on the cart in those colors get squirted with water if you're loud enough. But, this feature wasn't working, so it's hard to say how that actually works. But, it's a great idea to keep people excited about the ride. You get a lot of wind in your face, and the speed of the spin is variable based on whether you're going up or down a hump at the time, but it's pretty good.